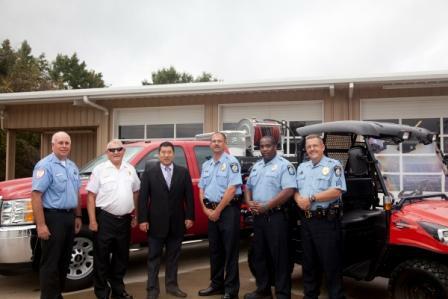 Wendell, NC – KIOTI Tractor, a Division of Daedong-USA, Inc., and an active business member of the local Wendell community, has announced their donation of two MECHRON 2200 UTVs, one to the Wendell Fire Department and the other to the city’s Police Department. Both departments had a growing need for a UTV to assist in preserving public safety throughout the Wendell area. KIOTI’s MECHRON 2200 UTV, The Ultimate Transport Vehicle, was first introduced in 2011 and has become popular for its capabilities in both work and recreational settings. Standard features include 4-Wheel Drive, a 22 hp, Daedong diesel engine, and 56″ wide cargo bed capable of holding up to 1,100 lbs. “When we spoke to KIOTI Tractor and told them about our needs, they were more than willing to help. In my 25 years of working at the Wendell Fire Department, this is the greatest one-time gift we have ever received,” states Fire Chief, Tom Vaughan. The Wendell Fire Department plans to add a water tank to the rear of the MECHRON 2200 UTV for use in fighting wood fires. Additionally, they will use it for rescues in areas that are difficult to reach with larger vehicles and for managing special events such as parades and festivals. The Wendell Police Department’s MECHRON 2200 UTV will be the first UTV the department has ever owned. “KIOTI is an active, supportive member of the community and this donation is far more than we could have anticipated,” says Chief of Police, Bill Carter. “As a small, but growing community, it would be a real challenge to dedicate traditional funds to purchase this type of special purpose equipment. This gift will help us tremendously in our efforts to preserve public safety.” With the UTV’s 25″ tires and 12″ ground clearance, it will be especially beneficial to police officers when conducting searches for missing persons or fugitives in wooded areas and along trails. Other uses will include deployment during special events such as festivals and parades, patrolling during potential natural disasters and crisis situations such as ice storms and hurricanes when use of traditional patrol vehicles might not be feasible, but calls for assistance increase and still need to be handled. Both the Wendell Fire and Police Departments plan to share the use of their MECHRON 2200 UTVs with other local organizations to do the most good possible with these generous gifts. Headquartered in Wendell, N.C., KIOTI Tractor is a market-driven company that has been supplying tractors in the 22-110 horsepower range to the U.S. and Canadian markets for over 30 years. Building on the company’s core product line and history of innovation, KIOTI has recently introduced new models and expanded its implement and attachment offering. For more information on KIOTI or KIOTI products please visit your authorized KIOTI Tractor dealer or visit www.KIOTI.com.